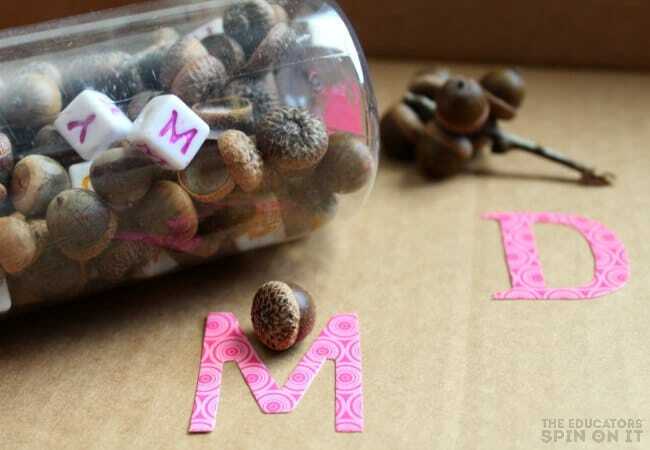 Work on letter recognition this fall with our Acorn Alphabet Sensory Jar Game! 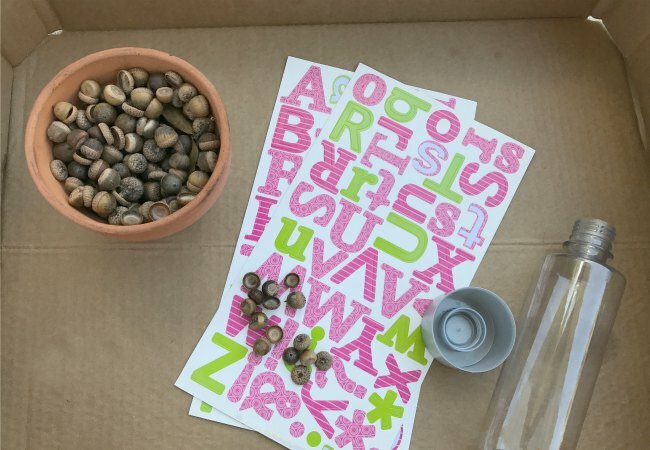 Head outdoors to search for acorns and then return to create this special hands on literacy focused game for your preschooler. 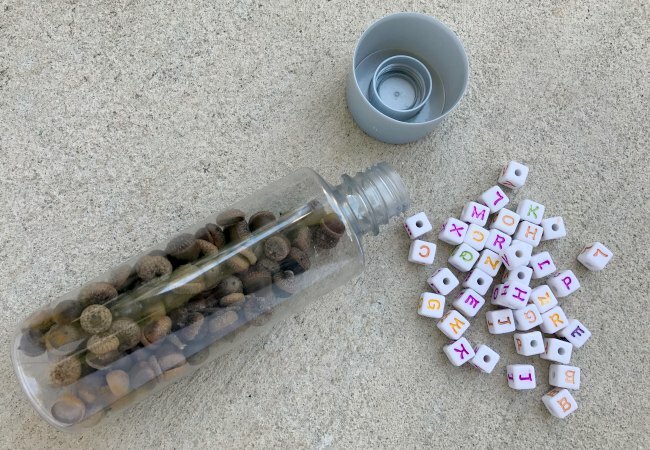 Encourage your child to practice their fine motor and eye hand coordination with this sensory jar game for fall plus learn to identify the letters of the alphabet! 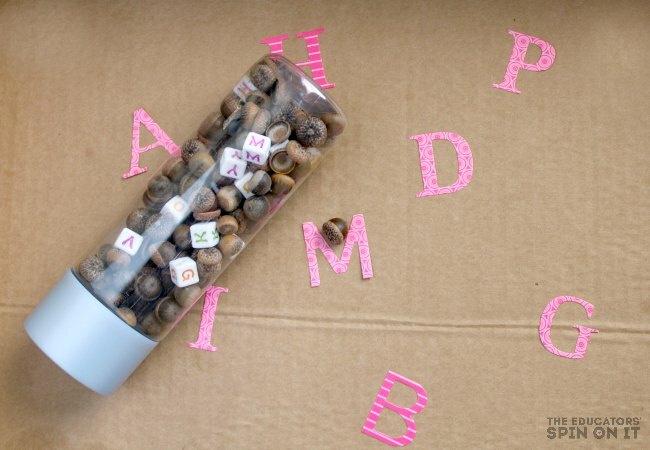 If you’re ready for sight words, you’re little one will love this I-SPY Acorn Jar too! Disclosure: Affiliate links to amazon are included in this post. 1. Go out in your yard or community and gather acorns into a container. Take time while you’re exploring to talk about the change in season. Try to see if you can find any squirrels climbing the trees too. See if you can find any little holes that the squirrels have dug searching for acorns. If you live is a place without acorns you can use these instead. 2. Once you’re back at home with your acorns it’s time to create a few fun acorn activities with them! Find a recycled water bottle and have your child fill it up with acorns using their fine motor skills. 3. Next add some letter beads to the acorns. Be sure to check to make sure you’ve added all of the letters of the alphabet. TIP: For younger kids you can add 5-10 letters to start with less. Give them a chance to be successful and then you can add more letters as they build confidence. 4. Now grab a recycled box lid and have your child add the alphabet letter stickers all around it. Use this time to talk about the letters they are adding to learn to name each letter and the letter sound. Plus it’s a great find motor activity too. 5. 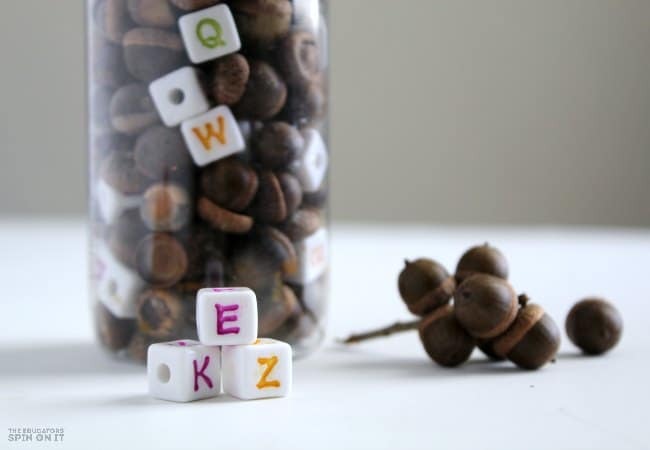 TIME TO PLAY OUR ACORN ALPHABET SENSORY JAR GAME! Challenge your child to cover the letter in the box with an acorn by marking one each time they shake the acorn alphabet sensory jar. You can play this game with a few letters to start and build up. You can also use acorn sight words and acorn numbers. 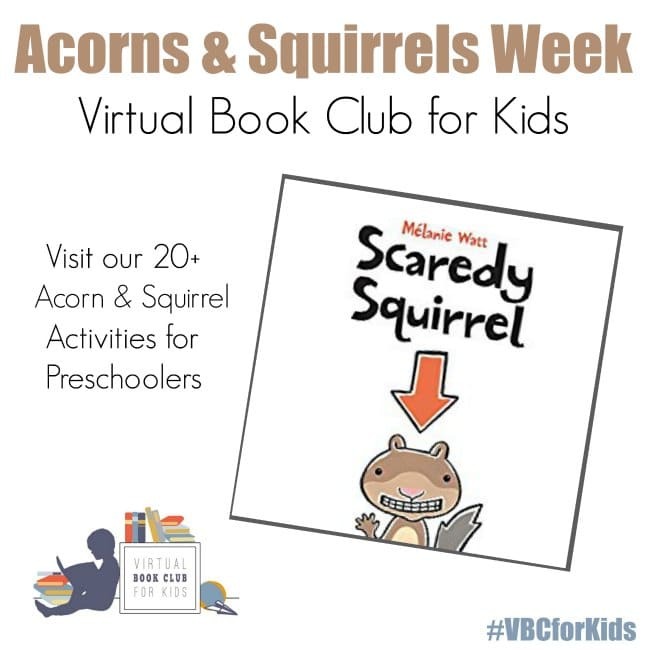 Share a photo with us how your child creates their Acorn Activity in our VBC Facebook group! Join now! or one of the other Acorn Books. You can share on our facebook page or join our VBC Facebook Group and share there with 7500+ members! 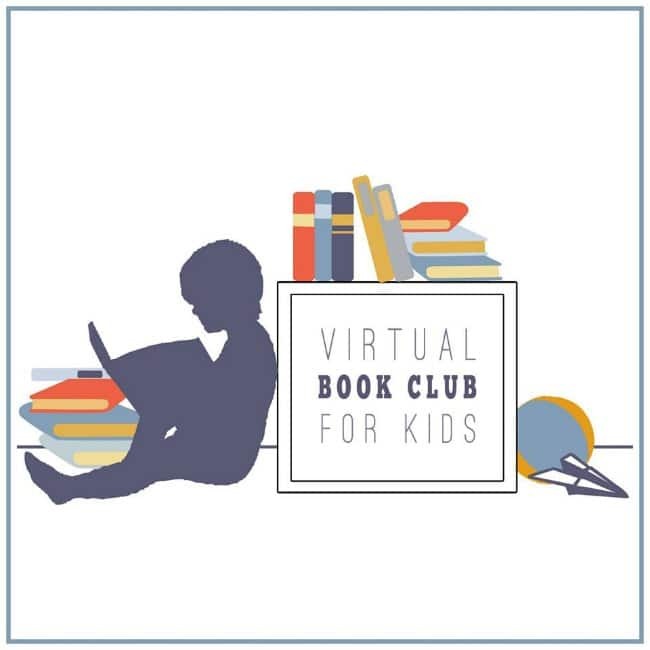 VIRTUAL BOOK CLUB HOSTS: Plus we’re inviting you to visit our Virtual Book Club for Kids cohosts sites for additional activity ideas all about Acorns and Squirrels. I’m featuring below here for you to go check out and get ideas for your preschooler ages 2-5. Join us next week with our a new theme of Farm! Did you miss last week about leaves? 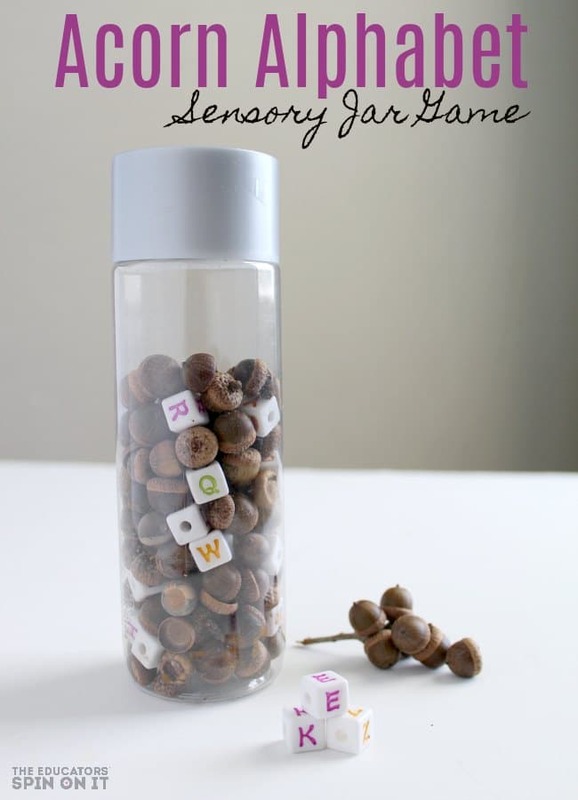 I love the look of this sensory jar! The letters pop out against the acorns. My daughter will love this!